Fresh Air Educators, Inc - leader in online outdoor education - is announcing a new Internet-based course for snowmobile safety education students. 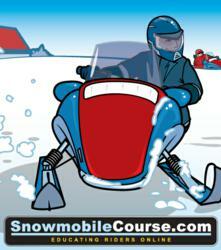 SnowmobileCourse.com includes a fully narrated, interactive online study guide, as well as snowmobile safety certification exams in several states. The snowmobile safety course has been in production for a long time and we're thrilled to have students use it for the 2010-2011 snowmobiling season. Snowmobile safety education has been increasing across the United States and hands-on training classes are having trouble keeping up with student demand. As a result, more and more state snowmobile safety agencies are adopting online education programs to teach and certify snowmobilers. The new snowmobile safety course is professionally narrated, interactive and features visual aids in every exam question. For the past 10 years, Fresh Air educators has been perfecting boating license courses as well as hunting safety courses, and is now focusing on other outdoor activities that require an education certificate or license. Snowmobile safety education is a niche that is expecting continued growth over the next few years, and Fresh Air is eager to provide this service to state agencies and their constituents. "We're very excited to get this new course up and running," says Kerry Moher, VP at Fresh Air Educators, "The snowmobile safety course has been in production for a long time and we're thrilled to have students use it for the 2010-2011 snowmobiling season." The online course will be first approved in Wisconsin, Utah, New Mexico and New York, with numerous additional state agencies currently going through the approval process. "If people are going to spend a few hours studying the course online, they don't want to stare at text the entire time. All of our courses are professionally narrated, and you'll never see a page of content that doesn't contain at least one image or interactive exercise that explains the content in more detail." Adds Moher, "Our students do exceptionally well in all our online courses, and that's due to the different teaching methods we use throughout. Whether you're a visual, auditory or hands-on learner, the course has something to offer you." At the end of the 5-chapter snowmobile course (which includes practice quizzes after each chapter) students will complete a 60-question multiple-choice snowmobile certification exam, in order to receive the snowmobile education certificate or snowmobile license, depending on the state. Every exam question in the chapter quizzes as well as the certification exam is illustrated for further clarification. The success rate in Fresh Air's online courses is very high, with an average overall final exam score of 90%, and a pass rate of 95%. Moher expects this trend to continue into the online snowmobile course. "After taking our course, students are very prepared for the final exam and the stats prove that. And in the end, over 98% of all our online students would recommend our courses to others who require certification. What more can we say?!" The fee for the online snowmobile safety course will be $29.95, paid after the student has completed Chapter 1. This fee includes unlimited attempts at the snowmobile certification exam, and Fresh Air offers a 100% satisfaction guarantee on all their courses. For more information about the snowmobile course please contact Kerry Moher with Fresh Air Educators.